As an artist, Roger Shimomura (born 1939) has focused particular attention on the experiences of Asian Americans and the challenges of being “different” in America. He knows well the pain and embarrassment associated with xenophobia: as a small child during World War II, he and his family were relocated from their home in Seattle to a Japanese American internment camp in Idaho. This painting takes as its source Emanuel Leutze’s 1851 painting Washington Crossing the Delaware, which is in the collection of the Metropolitan Museum of Art in New York City. 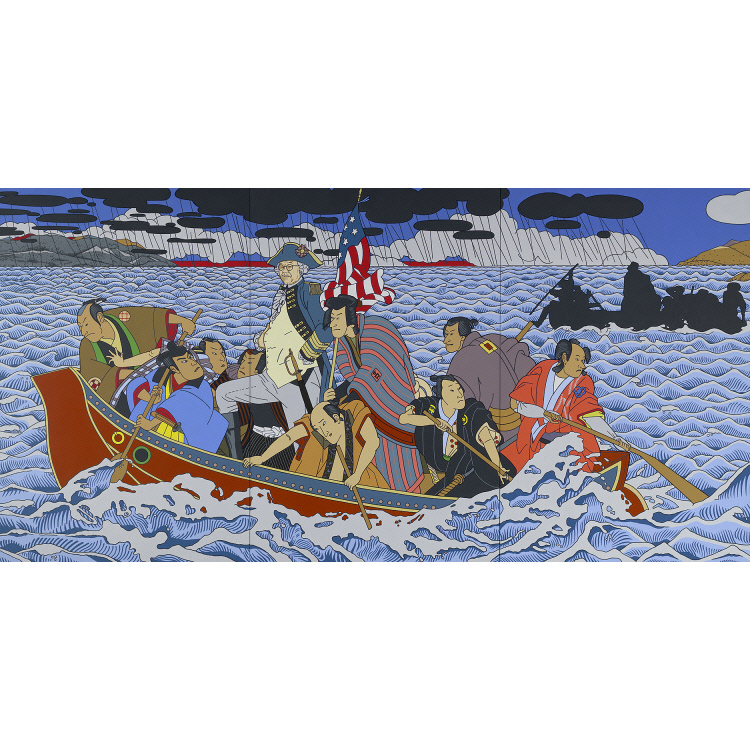 Shimomura presents himself in the guise of America’s Founding Father; he replaces George Washington’s colonial troops with samurai warriors; and he remakes the body of water they cross to resemble San Francisco Harbor with Angel Island (the processing center for Asian immigrants) in the background. The work echoes the compositional format of a Katsushika Hokusai wood-block print.